Known for sneaking quick hits of culture into commercial breaks, we're digging the series out of the vault. Heritage Minutes, Body Break, Hinterland Who's Who — hell, even those stranger-danger PSAs starring a couple of hoverboarding rabbits. Back when people still watched television on television, "interstitials" like these were a familiar fact of Canadian viewing, and starting this week, CBC Arts is bringing one back from the vaults. The series is Artspots, and between 1997 and 2008, its cross-country team of producers profiled more than 300 Canadian artists, sneaking quick hits of culture into commercial breaks. The videos are short docs — really short docs. For the most part, they clocked in at 30 seconds — just short enough that you could conceivably watch them on dial-up, and the unit was, in fact, among the first at CBC to produce video for the web. Stories focus on the thought process of a particular artist or reflect on the artwork itself, and if you skim through a decade of Artspots material, their vintage website included, the series now feels like a yearbook from the Y2K era. Ursula Johnson, the 2017 winner of the Sobey Art Award, got the Artspots treatment while she was wrapping her degree at NSCAD. Another one of this year's Sobey nominees, Divya Mehra, turns up in a profile, too — and the massive archive includes many notable names still active today: Aganetha Dyck, Alex Janvier, Wanda Koop, Nadia Myre. What makes the project unusual, though, was just how tightly it worked with the artists themselves. Series creator Mary Elizabeth Luka tells CBC Arts that Artspots eventually built a network of advisors across the country — a "target audience of 1,000 influencers," as she puts it. These people were gallery curators and directors, leaders of artist-run centres — folks from the cultural community who repped for their regions. That in crowd selected the artists featured on the show. And the artists, in turn, were offered unprecedented control over the final product. As Luka explains, the artists featured on the series got final say on what made it to air. That's extremely unorthodox for a documentary, but according to her, it was crucial to the project. The videos are told from the artist's point of view, offering a new way of thinking to the people watching TV — or RealPlayer for Windows 98 — at home. As Luka tells CBC Arts: "Part of what we had been trying for in that program was longevity — that we would produce stuff that you wouldn't cringe at when you saw it 10, 20 years later, stuff that would reflect, in some way, whatever that artist's work was at that time." "The best ones accomplished that." 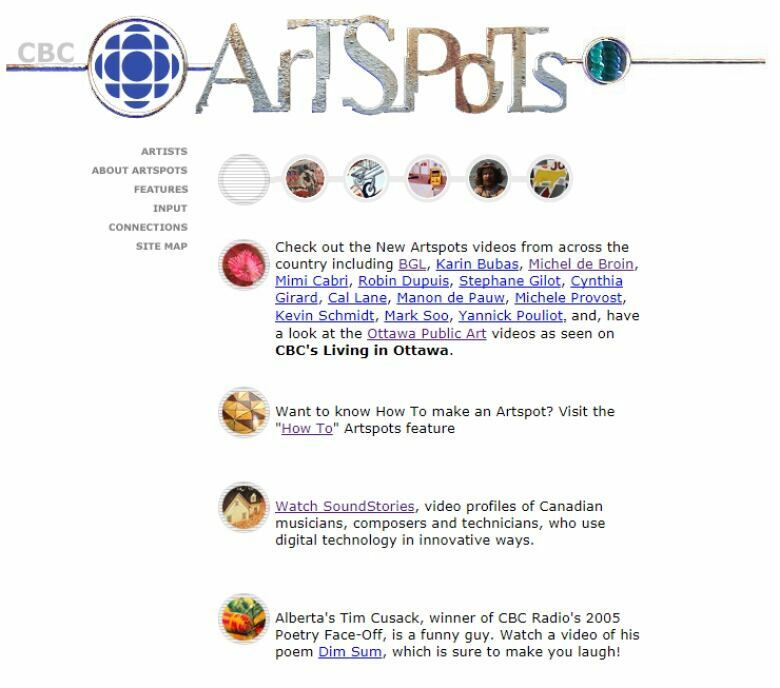 Throughout the winter, CBC Arts will be uploading a selection of Artspots. The vintage videos have been re-edited and condensed, with new music and titles. Look for the first one this Thursday! Here's a sample of what to expect.